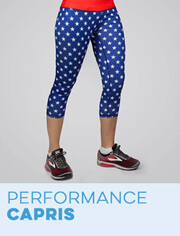 You put weeks and even months of training into every running event that you compete in. So why would you let your race bibs and event medals sit at the bottom of a drawer or buried in the closet? We know the time and effort that goes into successfully completing a race of any length and believe that these mementos deserve to be shown off proudly. 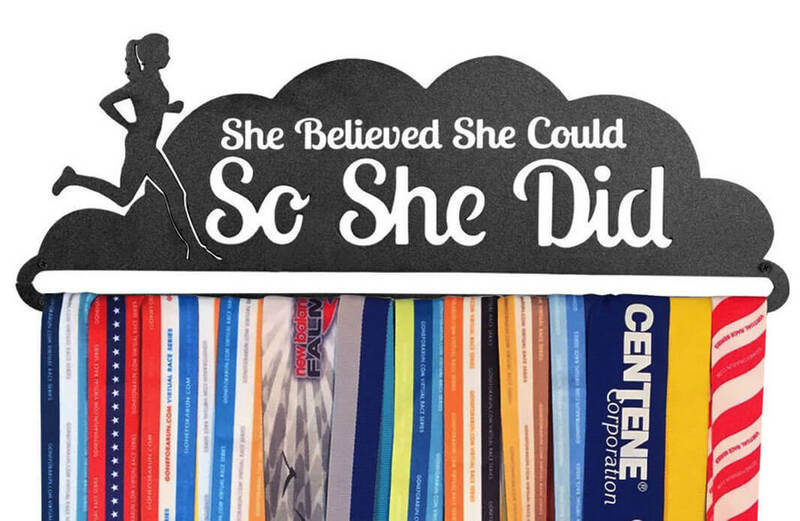 With runner bib display stands and race medal hangers from Gone For A Run, you can present your running accomplishments in any room in your home, and you'll always have a reminder of these memorable moments. 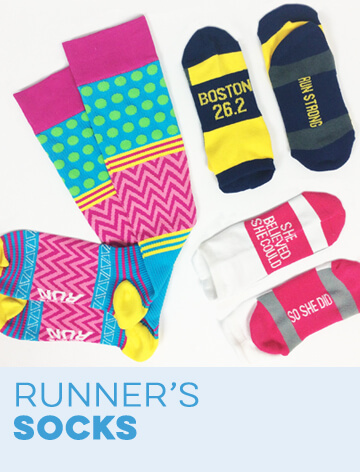 We have a variety of ways to exhibit the hard-earned items you receive for participating in or finishing a running event. These decorative runner bib and medal stands are like functional artwork that never goes out of style. Our BibFOLIO® race bib albums have covers made of wood or engraved bamboo and are designed for use with protective vinyl sleeves. Cover decoration options include original graphics, inspirational messages, custom photos and dry erase covers. If you'd rather display race medals, we have steel medal wall hangers and customized engraved medal hangers that can hold up to 180 medals – or more if you add extension bars. Light up your medals every time you're in a room by hanging them on one of our tabletop medal display lamps. Don't want to choose between showcasing one or the other? 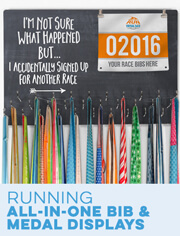 You don't have to thanks to our all-in-one running bib and medal wall displays. 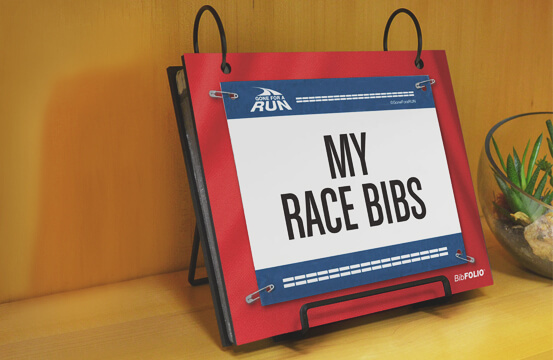 With our race bib stands and running medal hangers, you can show off your treasured prizes on a table, bureau, wall, shelf or anywhere else you want to place them. 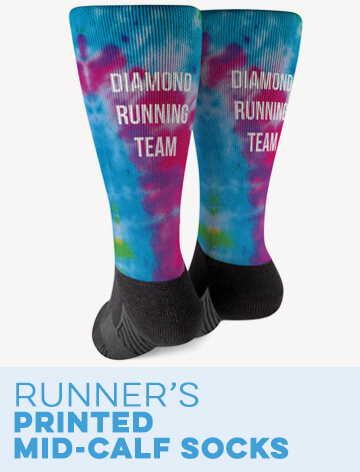 By putting them out for everyone in the house to see, you and your running friends can celebrate the good times while looking forward to many more. We guarantee your satisfaction and have excellent customer service to help you get the right display stand fast. Whether you’re looking for a race bib album to display and protect your hard-earned and irreplaceable race bibs, a medal display that can hold anywhere from a single medal to 180 medals (or more, as select designs can be expanded beyond their initial capacity using extension bars), or a specially combined wall unit that displays both race bibs and medals side by side, we have you covered. 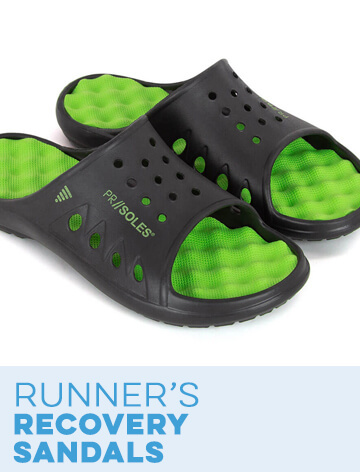 These pieces of functional art are an excellent addition to any runner’s home and are an ideal gift for any occasion. No more stashing race bibs and medals in drawers or boxes - they’re meant to be looked at and celebrated for the accomplishments they represent! 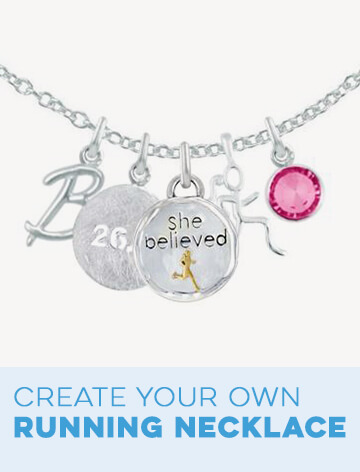 Runners have always struggled with the appropriate way to display their one-of-a-kind race bibs, as they are a unique size and difficult to simply frame (plus, that’s nearly impossible to do when you have a large collection of bibs from all the races in which you have participated. 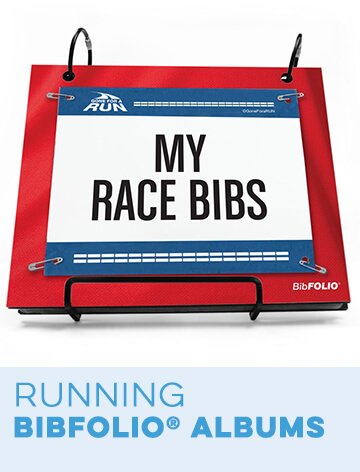 That’s why we designed the BibFOLIO® Race Bib Album, which is a hardwood covered album bound with twist cable rings that can hold as many as 100 bibs (or 50 in vinyl protector sleeves.) The album is perfect for storing, organizing, and displaying a runner’s bib collection - and tells the story of a runner’s life through their races and individual bibs earned. 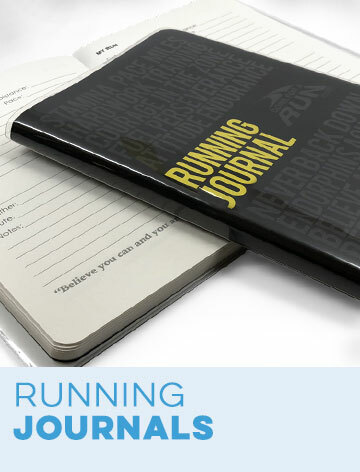 Our race bib albums have a huge selection of cover colors and styles, and can even be personalized with a name for a special touch and an excellent running gift idea. Runners love finally being able to flip through their race bibs any time they’d like, both because they’re proud of all they have achieved, and as a little reminder of how far they have come when facing a new challenge or while breaking through a plateau. Our race bib vinyl protector sleeves add an additional layer of protection to the bibs contained within the album, as they are designed from high quality vinyl, specifically to fit a BibFOLIO race bib album. 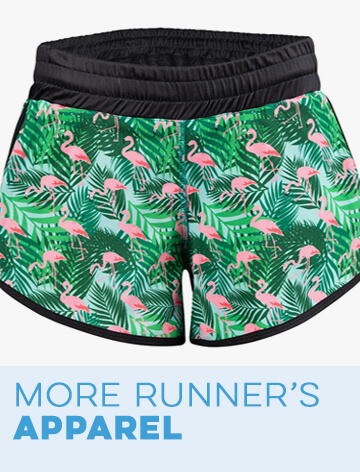 Runners will love the long-lasting durability of the sleeves, and the ability to browse the album with no worries, as the sleeves protect the bibs inside from smudges, stains, or other accidental damage. With different styles and capacity, our extra-large displays combine the functionality of our BibFOLIO® Race BIb Album with the stylish convenience of our medal hangers - in more than one style - for the perfect running display for any room of a home. Our BibFOLIO™ Plus Race Bib and Medal Display has an album nestled at the top of the wall hanger, above a hand-forged black metal bar that holds as many as 24 medals. This specific display can easily be made larger using extension bars, to hold as many medals as desired and is a favorite of runners who want to showcase their medals and bibs side by side, as they should be. Our extra large Hooked on Medals board has 30 hooks, each of which can hold up to six medals, making it ideal for runners who have particularly large medal collections. The convenient hook style makes it easy to add new medals and move ones that are already hanging on the display for a different look. The large hook board also has two clips, positioned next to the original running artwork (and, if desired, personalization) to hold and display race bibs along with the medals for a stylish and bold way to show off all those medals and bibs. We have an extensive selection of running race medal hangers for any style and taste, made from different materials with selected designs that can be personalized with your own text, logos, or even photographs. Our single medal hooks have 4” X 4” custom printed ceramic tile with everything from a replica race bib, a favorite running photo, a specific state design, or myriad other motivational, fun, or race- and distance-specific designs. Use our single medal hooks to hang a favorite medal - or the first one earned - or use multiple hooks to create a wall that singles out specific states and races with a corresponding hook for the medal earned in those races. The versatile hooks are sure to be a favorite for showcasing medals that are particularly meaningful or just personal favorites. Our tabletop medal display is made from hand-forged steel and stands on any table or flat surface, holding as many as 60 medals in a convenient display that spins so it is easy to admire all the medals. Our MedalART medal hangers are made from hand forged black metal with laser-cut designs that are inspirational, as well as designed specifically for special races and distances in order to showcase a favorite. These gorgeous pieces of art initially hold up to 24 medals, though by using extension bars (each of which hold 24 medals) the display can be expanded to meet any runner’s needs - so no medals are left behind. The extra long display can hold as many as 96 medals, right out of the box, and is an excellent choice for a runner who already has a large medal collection, or many races on the horizon. 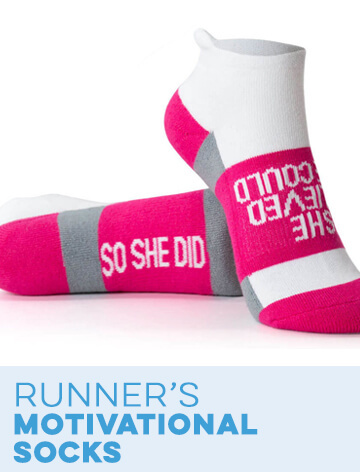 Our customizable RunnersWALL displays have a black metal frame with a custom printed insert with a personalized quote, running photos, a name, and hundreds of designs for the perfect display for any runner’s style or tastes. With everything from faux wood grain, bamboo, and chalkboard to glittering artwork, these unique displays hold over 20 medals for a stylish and eye-catching display for any room of a runner’s home - or even to display in their office. Once you’re Hooked on Medals, our unique hook medal display is a great choice with many different designs - and selected ones can even be personalized - and nine hooks, each of which can hold four to six running medals. This is an excellent gift for a runner to display their medals on with room for personalized names, photos, and text, as well as original designs and chalkboard, wood grain, and other stylized looks on the shiny, finished wood boards.